Diva weekly challenge #167 is a DuoTangle: Well and Punzel. Good challenge for me as I've never given Punzel much of a chance before, it just wasn't working for me. Glad I gave it the extra effort as I really love this result today! This is on an approximately 7" x 10" sketchbook page. Follow this link to the Diva Challenge which also provides links to the tangle instructions. 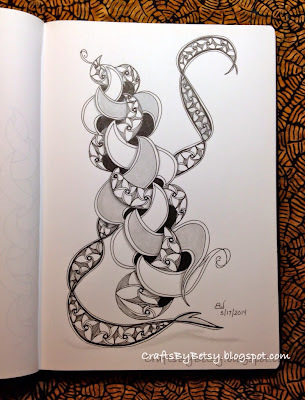 Follow this link for more information on Zentangle®! Your tile is beautiful, I love the design. Beautiful flow, and I like very much how you combined the two patterns in a true "duo"
wonderfully done. I hadn't thought to tangle within the bits of punzel. i look at this tangle,i believe there was high concentration.or can it really come out like this in a meditation? when iam tangeling...well,punzel,it needed concentration.your tile is very nice. This is amazing! I love this picture! I also wanted to say Thank you for the card you drew for me before you left the hotel because I didn't get a chance to! I was the front desk agent you spoke with! Thank You So Much!